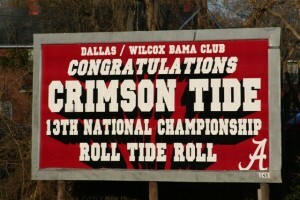 Roll Tide and welcome to the Dallas Wilcox Bama Club website through the Alabama National Alumni Association. 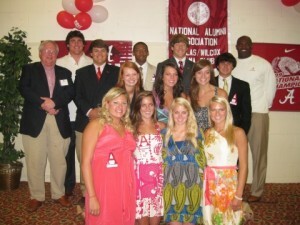 The Dallas Wilcox Bama Club is an arm of the National Alumni Association and our membership is made up of Alabama fans, friends and alumni. We exist to distribute scholarship monies to area seniors from our 6 endowed scholarships and promote the excitement and fun of Alabama athletics and academics. We have fun events here in Dallas and Wilcox counties as well as adventures in Tuscaloosa. We have had the privilege of having speakers at our events to the likes of Dr. Robert Witt, Eli Gold, Baron Huber, Freddie Roach, Todd Alles, Sparky Woods and others. We also gave out 13 scholarships to the tune of $ 13,000.00 to area students headed to the University of Alabama for the 2010 fall semester. We are very proud of our endowed scholarship sponsors as well as our largest membership numbers ever. Please continue to visit our website as we update this site on a continuing basis listing our past and future events. If you have an interest in the Dallas Wilcox Bama Club or any inquiries, you can contact us at P.O. Box 2395 Selma, Al. 36702. This year the Dallas-Wilcox BAMA Club awarded 13 $1000 scholarships at the National Championship Celebration/Annual Spring Meeting. James McNeill, Scholarship Chairman, and our outstanding speakers for the event, Baron Huber and Assistant Strength and Conditioning Coach Freddie Roach, with eleven of the thirteen scholarship recipients. The first BAMA Club endowed scholarship was the Sam Earle Hobbs Endowed Scholarship, which was endowed in 1987 in honor of Sam Earle Hobbs who had served the University as a Trustee and also as Interim Chancellor of the University system. We went over fifteen years before our next endowed scholarships, which were the Sterling Price Rainer Memorial Endowed Scholarship and the Blackbelt Endowed Scholarship. Approximately four years ago we added the Betty Jean Perkins McKelvey Memorial Endowed Scholarship. This past year we added two more endowed scholarships, the Doris and Henry Plant Memorial Endowed Scholarship and the David E. Roberts, Jr. and Rebecca McKinney Roberts Endowed Scholarship. We began with an initial endowment fund of $10,000.00 and we now have a total endowment fund of over $194,000.00. The income earned on these endowments is used to award the scholarships for their freshman year to students from Dallas and Wilcox Counties. Thirteen $1000 scholarships were awarded this year. Thirteen was a lucky number for our Bama Family this year! RTR!